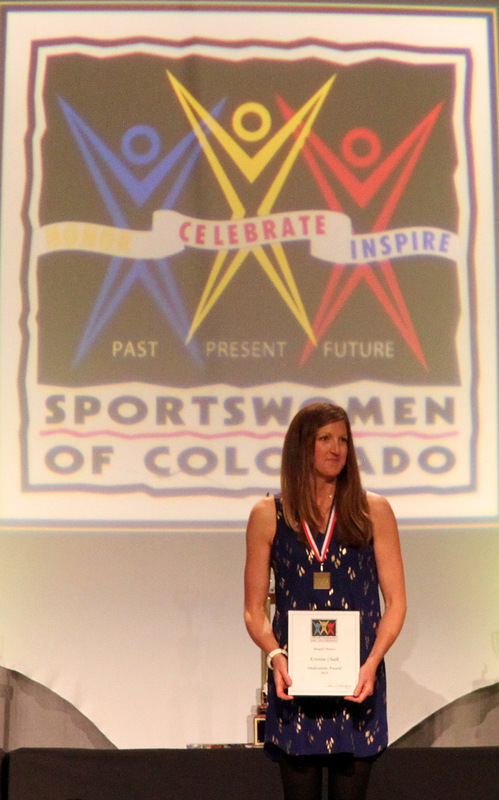 I first heard about this great organization called Sportswomen of Colorado a few years ago when our friend Christy Mahon from Aspen won an award for her ski-mountaineering accomplishments when she became the first female to ski all of Colorado’s 14ers. 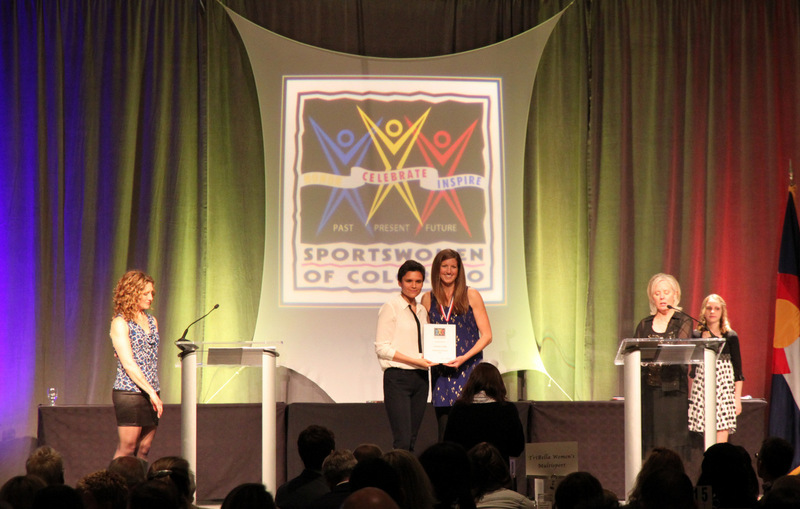 The primary goal of Sportswomen of Colorado is to promote women’s athletics by recognizing those exceptional achievements by very talented and wonderful women. It is the first community-based organization in the nation to do so. I always thought it would be fun to nominate Kristine for her 7 Summits quest, but at the time we were a few years off. Then, when we finally completed the 7 Summits in December 2014, I didn’t waste any time in the spring of 2015 to get the nomination rolling. Most of the awards really honor team-oriented high school athletics whether volleyball, track, swimming, or skiing. There are a few special awards for other fields of sports such as triathalons and, yes, mountaineering. And, then, the big award each year is THE Colorado Sportswoman of the Year, which the organization announces at the end of each year’s banquet. 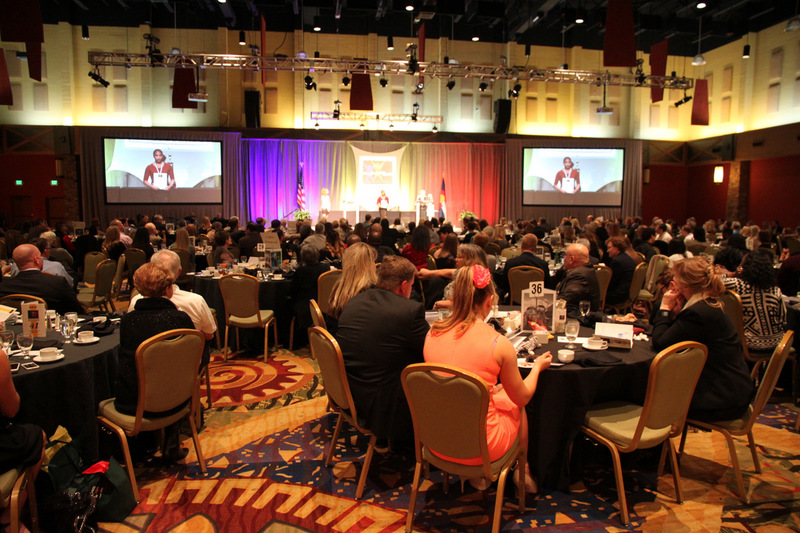 Last year, Vail Valley local Mikaela Shiffrin won the Sportswoman award for her professional ski racing accomplishments in 2013. Ironically, Mikaela was Kristine’s former art student at Vail Mountain School when Kristine taught there. After receiving wonderfully-written letters of recommendations by our great friends and supporters Rob Casserley and Diana Scherr, I submitted the entire nomination to the organization and the wait was on. Finally, just this past January we heard Kristine was to receive the special award for Dedication in Mountaineering for her 7 Summits accomplishment. We were all beyond thrilled! After all, I like to think of myself as Kristine’s biggest fan and I just wanted her to be recognized. Its not every day a woman (or for that matter an American woman) climbs the 7 Summits. In fact, as of now, I still only believe 20 or so American women have climbed the 7 Summits and Kristine is the first from Colorado. So, we headed down to the Denver Marriot Tech Center on Sunday afternoon, March 8, to attend the very nicely done awards banquet. Only, we made one big mistake – driving to Denver on a Sunday afternoon. Fortunately, we never have to deal with skier traffic (and hopefully never will), but we hit it smack on. Good friends (Ben Conners & Brian Miller) have told us, “No one can tell you what skier traffic is, you have to experience it for yourself”. Well, we did. And, man, its awful. Nevertheless, we arrived at the banquet just a tad late for the dinner itself though we missed the hour long cocktail party. It was a fun evening, a great dinner & dessert, and really impressive to hear of all the award winners and their just plain awesome accomplishments. We were talking about how several of these high school women will likely be Olympians soon enough. The keynote speaker was Kate Fagan of ESPN fame. They had pictures circulating on the big screens throughout the dinner and we loved seeing the ones I submitted of Kristine ski-mountaineering in Antarctica and on the summit of Everest. Finally, Kristine was called on stage to receive the Dedication Award during which the announcers made a very nice introduction of Kristine, her accomplishment, and her teaching accomplishments here in the Vail Valley. I scooted near the back and took what pictures I could though the photographer at the front obviously got the goods. I was very proud. 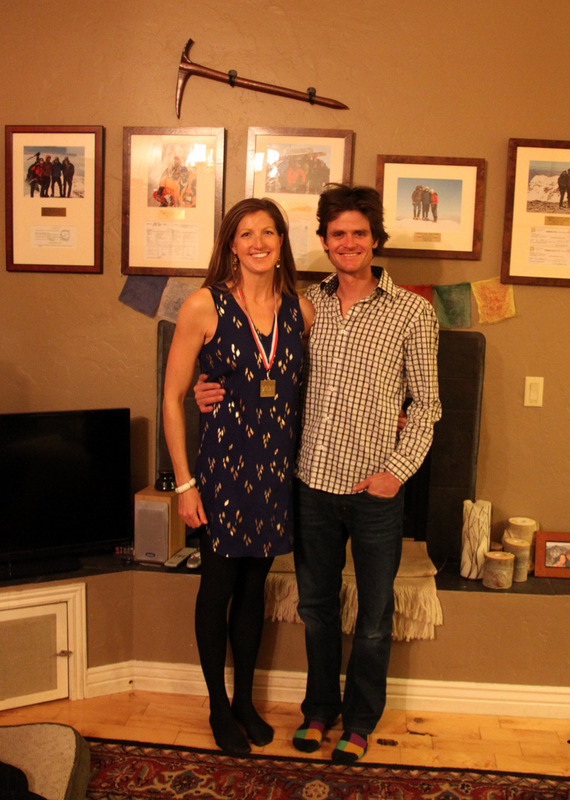 The finale of the banquet was the announcement of this year’s Colorado Sportswoman and, not suprisingly, Mikaela won it again for her gold medal at the 2014 Sochi Olympics. Hard to complete with a gold medal, we thought. I do wonder if adventure-type hobbies such as mountaineering, climbing, etc will ever compete with those spotlight media-hyped sports. Probably not. But, maybe that’s a good thing. Rob Casserley put it best when he said in his letter of recommendation for Kristine: “Mountaineering is not a sport replete with gold medals, cheering crowds, or podiums.” How very true. Anyway, it was nice to hear that the Sportswoman award would be kept local for one more year. Congratulations to Mikaela. 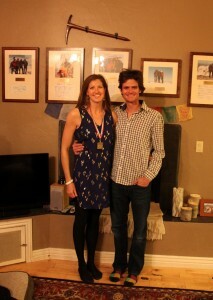 We both wish we could have seen her, but she was in Europe for ski racing and could not attend. Though, she had a nice little video addressing the awards banquet crowd and thanked the organization for the award. We both have wondered if she’d remember Kristine as her art teacher. We made a quick exit and arrived back home in Edwards around 11pm to find a sleeping Sawyer and Diana Scherr’s sweet 10 year old daughter, Piper, in the bed next to Sawyer’s crib. Diana & Piper had relieved good buddies J & Megan of baby duties halfway through the evening. We chatted with Diana for awhile and just thanked her (& Piper) so much for watching Sawyer. It was such a huge help. We got some really good friends, that’s for sure. We actually never took a picture of Kristine & myself at the banquet, so Diana was nice enough to take one of us in our living room with Kristine wearing her Dedication award medal. Congratulations again, Kristine. Not only does your 7 Summits accomplishment deserve recognition and accolades, but all of your accomplishments throughout life deserve admiration and celebration. 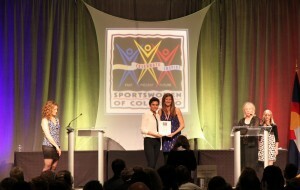 You will always be all of our Sportswoman of Colorado. Special thanks again to Diana & Rob for their outstanding letters of recommendation. You guys are really good friends. 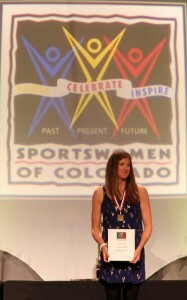 To nominate someone or learn more about Sportswomen of Colorado, check the organization out at http://sportswomenofcolorado.org/. Nice overview Brandon! We love that you are her biggest fan (are we now 2nd? :-)) Love you both!!! So fantastic, both of you! Love the photos and accolades coming your way, Kristine. So very deserving. Love to you both! Brandon- What a well written and beautiful tribute to your wonderful wife & lifelong love. It brought tears to my eyes- We are so very proud of Kristine & you for the the dedication & passion you both exhibit throughout your lives- This results in amazing accomplishments. We so love you both!! Yeah Kristine! I like the big screen shot! Nice write up Brando.